Toyota Motor Corp has announced the recall of 310,000 FJ Cruisers due to a door panel issue, which may lead to seat belt retractor detachment. Affected by this weekend's seat belt recall are model year 2007 through 2013 Toyota FJ Cruiser vehicles, manufactured exclusively in Japan. According to Toyota, cracking may occur within the vehicle’s door panels if excessive force is used to close the door. As a result, the seat belt retractor bracket may become fatigued over time and in some cases fall off. Of the FJ Cruisers in question, there are 209,000 in the United States; 52,000 in the Middle East; 16,000 in Canada; 13,000 in South America and Central America; 7,000 in Oceania; 5,000 in China and 3,000 in Africa. Toyota has received one complaint related to the problem, but no accidents or injuries have been reported. After receiving the lone complaint, Toyota conducted a field survey of 19 vehicles and found door panel cracking on one vehicle with 87,000 miles. Toyota has not released a recall notice schedule, but did state that it will begin notifying affected owners in the “near future.” Authorized dealers will fix the problem free of charge. In the meantime, FJ Cruiser owners can contact Toyota at 800-331-4331 or visit www.toyota.com/recall. Concerned drivers may also call the National Highway Traffic Safety Administration’s Vehicle Safety Hotline at 1-888-327-4236 or go to www.safercar.gov. 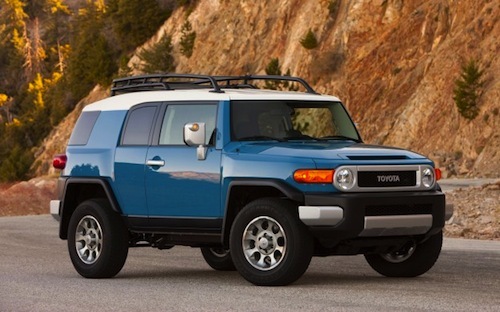 This week’s FJ Cruiser recall marks Toyota’s third substantial recall this year. In January, Toyota recalled 907,000 vehicles worldwide over an electrical fault in the supplemental restraint system (SRS), which could cause unexpected air bag deployment. The recall impacted 752,000 model year 2003-2004 Toyota Corolla and Toyota Matrix vehicles in the US, as well over 150,00 vehicles in Canada, Mexico and Japan. Toyota also recalled 385,000 model year 2006-2012 Lexus IS vehicles because of a windshield wiper flaw earlier this year. According to Toyota, affected vehicles may contain improperly tightened wiper arm nuts, which may lead to windshield wiper malfunction. Toyota’s three sizable recalls place it ahead of all automaker in terms of total vehicles recalled in 2013. Toyota led all car companies last year with more than 5.3 million in recalls. The amount was nearly 1.5 million more than Honda, which finished second. Introduced in 2006, the Toyota FJ Cruiser is a retro style SUV with off road capabilities. The FJ Cruiser enjoyed early success amongst consumers selling over 56,000 vehicles in 2006, but has struggled in recent years, selling just 13,000 SUVs in 2012.